Most of the recent asylum seekers caravanning and otherwise making their way to the U.S. have been from three failed Central American states: Honduras, Guatemala, and El Salvador. Up to now, we’ve heard little from a fourth troubled country, Nicaragua. That is now apparently changing. Political unrest, governmental repression, and the usual harsh economic picture are among the motivations for uncounted thousands of Nicaraguans to leave the country recently, 29,000 of whom have gone to Costa Rica. Increasingly, many of those still in Nicaragua, a country of six million, are thinking of heading to the United States. The U.S. is already home to more than 400,000 Nicaraguans, mostly in California and Florida. Many of those came during the long-lasting civil war which ended in 1990. Others fled the devastation left by hurricane Mitch in 1998. Those are now permanent U.S. residents, with no intention of going home. Hoping to join them are a growing number of their fellow Nicaraguans. “Since April there has been a tremendous increase” of Nicaraguans, said a Florida immigration lawyer. Some of the asylum seekers from Nicaragua come to the United States on tourist visas and simply over-stay. Others join their fellow Central Americans in walking across the border from Mexico and surrendering to the Border Patrol. (Thirteen hundred were recently caught at the border.) Either way, they are then in America, whose government is hamstrung by its own laws and policies to send them back. The Nicaraguan migrants, along with their fellows from Central America, are part of a perfect storm of crime, economic collapse, political violence, leftist pro-immigration propaganda, and a confused and feckless U.S. immigration policy, all combined to create an unprecedented crisis that many U.S. leaders refuse to acknowledge. 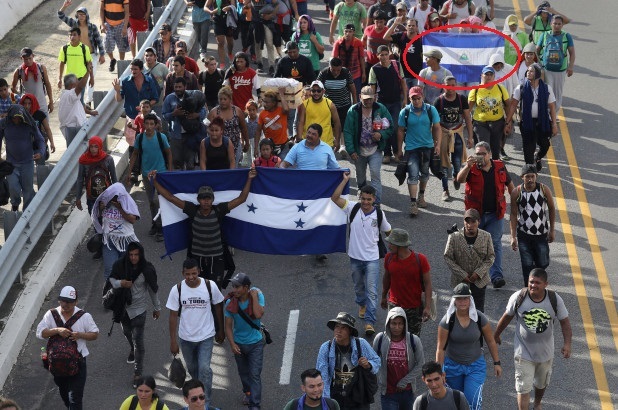 Migrants carrying Nicaraguan flag crossing the Guatemalan border into Mexico. For more, see the Chicago Tribune.